LoadLibrary failure: The specified module could not be found. Working with a business audience, I am frequently called upon to send analytic results to clients in the form of Excel Workbooks. The xlsx package facilitates exporting tables and datasets Excel, but I wanted a very simple function that would let me easily export an arbitrary number of R objects to an Excel Workbook in a single call. Each object should appear on in own worksheet, and the worksheets should be named after their objects. 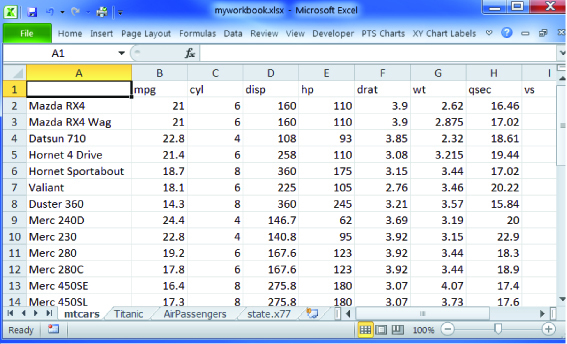 should save the R objects mtcars (a data frame), Titanic (a table), AirPassengers (a time series) and state.x77 (a matrix) to the workbook myworkbook.xlsx. Each object should be in it’s own worksheet and the worksheet should take on the name of the object. One solution was to write a wrapper for write.xlsx() function in the xlsx package. The method will work for data frames, matrices, time series, and tables, and has simplified my workflow greatly.